Throughout the mid-’80s to ’90s, a time when thousands of Cubans fled the communist island nation in search of political freedom, Gustavo “Gus” Rodriguez stayed. Boldly standing for civil liberties, such as freedom of speech, he worked as an independent journalist. This was illegal since independent news sources were prohibited. Gus reported vital information not covered by the Cuban media. This included anything from dwindling food rations to names of recent arrests. Though he didn’t speak against the nation’s leader, Fidel Castro, his actions were forbidden. The censorship ensured he couldn’t distribute the news within Cuba. So instead, Gus sent articles to surrounding countries to be published. He reported to the world, but not to his own country. That is until 1985, Radio Marti, a radio station based in Miami, started broadcasting to Cuba. The United States Government created the station to combat communism. Gus reported to Miami using any phone he could (they were scarce). Then, the news broadcasted back to Cuba, in Spanish, via Radio Marti. Avoiding backlash, some independent journalists used aliases, but Gus used his name. He feared, if he used a misleading alias, people might question the validity of his reports. He wanted to foster trust and credibility. Incarcerated countless times, he withstood subhuman conditions. Although a non-violent offender, like all political prisoners, he was housed in maximum-security facilities with hardened criminals. He suffered worse for opposing communism. Imagine solitary confinement. It might sound appealing, considering the alternative of being housed with brutal convicts, but for political prisoners, it’s torture. To heighten the punishment’s vindictive nature, guards routinely used sensory deprivation, such as detaining inmates in pitch-black, poorly ventilated cells with no way of knowing the date or time. On one occasion, Gus was detained in solitary confinement for an entire day. Having a rectangular base, the cell measured two-feet wide, by three-feet long, by three feet tall. He sat with his knees against his chest, unable to move. Sadly, these experiences are common, and it’s difficult to keep track of political prisoners. Names aren’t typically published in the news. While Castro was alive, he didn’t want the public thinking anyone opposed him, and he wanted to avoid seeming corrupt for making random, unreasonable arrests. But in November of 1999, he released a list of those he deemed national enemies. Gustavo Rodriguez--a man from the small town of Caibarien, Villa Clara--along with several other independent journalists, was among the first to be named. At the time, Gus wanted to stay and continue fighting for an uncensored press. He believed Castro’s threats were empty, but Yalili wanted to leave. Fortunately, they did--because within six months of their departure, the remaining blacklisted journalists were arrested. Their plane landed at Miami International Airport. For the first six months in the U.S., they stayed with Gus’ brother in Marathon, Florida. However, feeling like a burden, they moved into a studio apartment in Miami. It was small and expensive--but it was preferable to the poverty in Cuba. Around 1990, the Soviet Union fell, and an extended period of economic turmoil, aka “The Special Period,” came over Cuba. Until this time, the Soviet Union subsidized the economy. The lost financial support, coupled with the U.S. ban on trade, spelt trouble for Cuba. Food and oil were scarce, and the country experienced frequent, widespread power outages. Although conditions weren’t ideal in their studio apartment, Gus and Yalili felt thankful to have a home. To make ends meet, they each worked two gas station jobs. Since their degrees aren’t recognized in the U.S., and they didn’t know English yet, options were limited. Gus, having a degree in economics from the University of Santa Clara, and Yalili, a degree in computer programming--now worked two shifts a day. Aware this wasn’t maintainable, Gus located his uncle in Portland, Oregon. The uncle lived in a nursing home, but he offered to let them come stay. Gus and Yalili sold their belongings, quit their jobs, and began the 47-hour drive from Florida to Oregon. Three days into the trip, while in Tennessee, Gus received a phone call. The caller told him his uncle died, and there was no longer a place for the Rodriguez’s in Portland. Having a family to care for, Gus desperately contemplated what to do. With nothing to return to in Florida, he considered any connections he might have. At this point, he lost hope. They were in a foreign country and could barely speak the language... Finally, Gus remembered an old boss lived in Fort Wayne. He contacted her, and in 2001, the Rodriguez’s relocated to Indiana. Life settled for a while. In 2003, Yalili gave birth to their second son, Bryan, at Parkview Randallia, and Gus supervised at the Community Harvest Food Bank where he developed programs to benefit families in the community. This job let Yalili stay home with the children until they went to school. When Yalili needed to return to work, the Great Recession struck. She couldn’t find a job, even though she submitted over 200 applications. Figuring, food is always a necessity, the couple opened a restaurant. They gathered some traditional family recipes and signed a lease. In 2009, the original Caliente Cuban Cafe, on State Street, opened. At first, Yalili managed and cooked. As business grew, Gus resigned from his job to help. In the beginning, the couple grocery shopped daily. They didn’t know much about running a restaurant, let alone what inventory was. Yet, they quickly learned, and in 2017, they opened a second location on Wayne Street. It has the same mom and pop feel, but unlike the first location, guests are greeted by a host and shown to their table. This makes for a more personal experience. They’ve kept the same home cooked meals while adding dishes to the menu, and they’ve renovated the building to give it a modern feel. Despite the growth and change, Yalili and Gus, to this day, still cook at Caliente. They’re proud to be the only Cuban Restaurant in Northeast Indiana, and they’re honored to have the opportunity to introduce authentic cuisine to the people of Fort Wayne. To everyone at the restaurant--from the Rodriguez’s, to the refugee families they house, to the homeless individuals they employ--Caliente represents freedom. It’s a reminder that no matter your present circumstances, with courage and perseverance, you can create a better future. At Caliente, each meal is seen as an opportunity to dish up some delicious food with a side of hope. 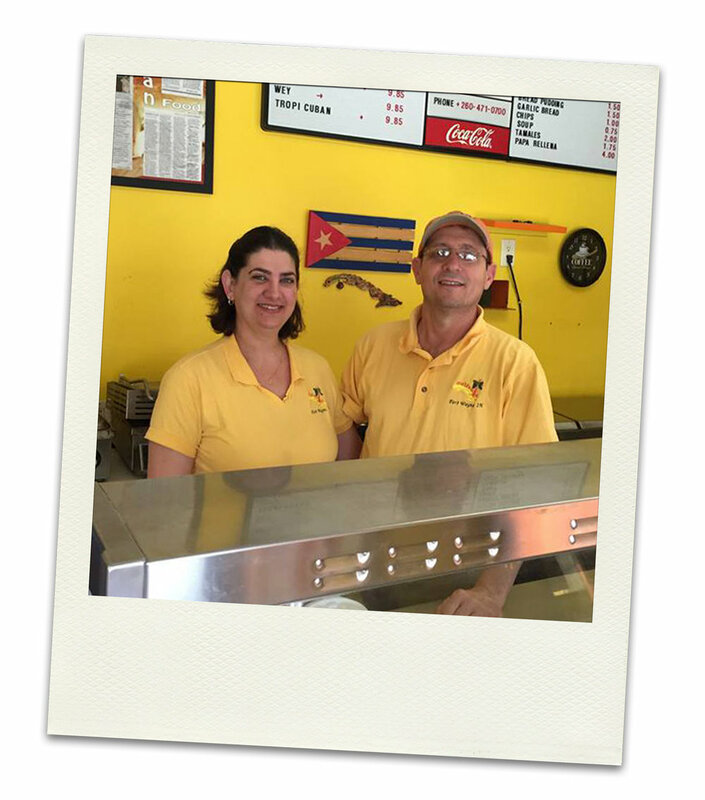 Come visit the only authentic Cuban restaurant in Northeast Indiana, and try a traditional meal. The food is made fresh, from scratch with quality, flavorful ingredients. You’re sure to feel like you’ve visited the sugar-white shores of Cuba!